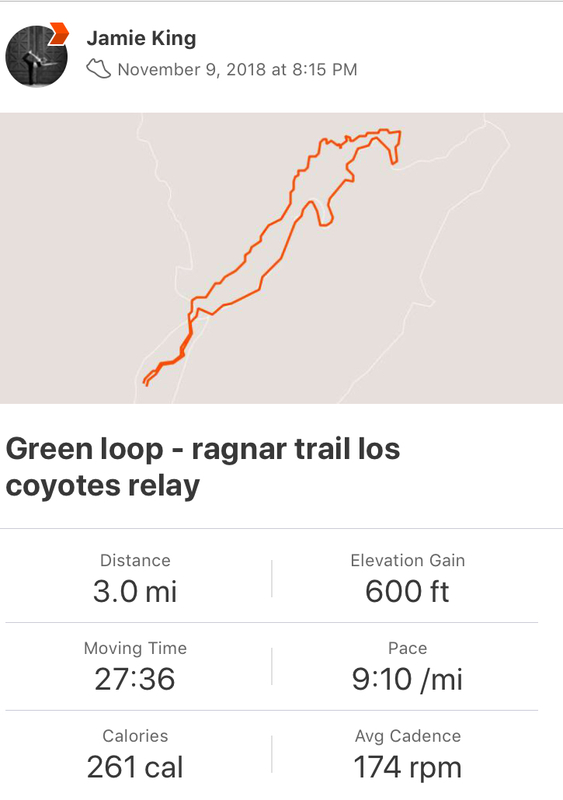 I’ve run a few relays in my day but I’ve never done anything quite like the Ragnar Trail Los Coyotes relay. Prior to running Los Coyotes, my only experience with relays was road relays. 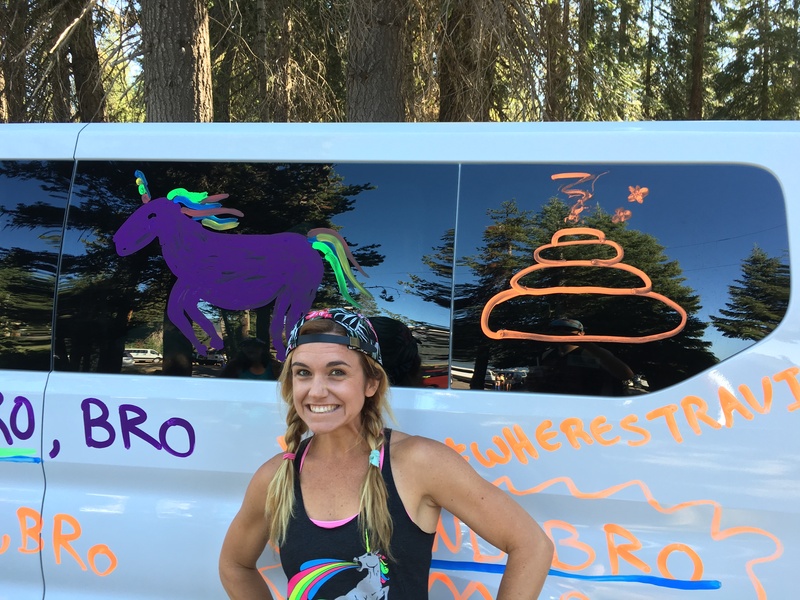 When you run road relays, you typically hop in a van with 5 other smelly people (and say goodbye to another van full of 6 other smelly people) and cruise around all day and all night, following your runners to a final destination, exchanging runners at various checkpoints and even exchanging vans. 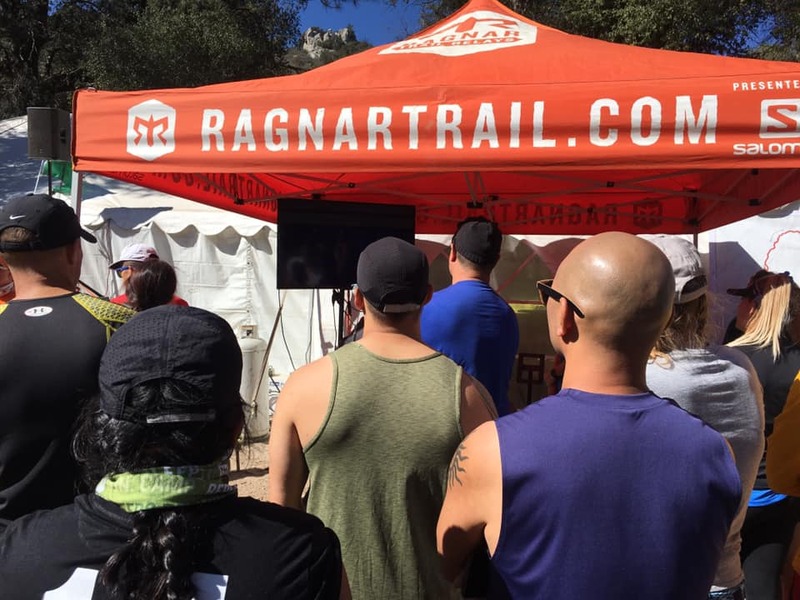 Ragnar Trail relays are different. There are no vans and you don’t split up from your team. 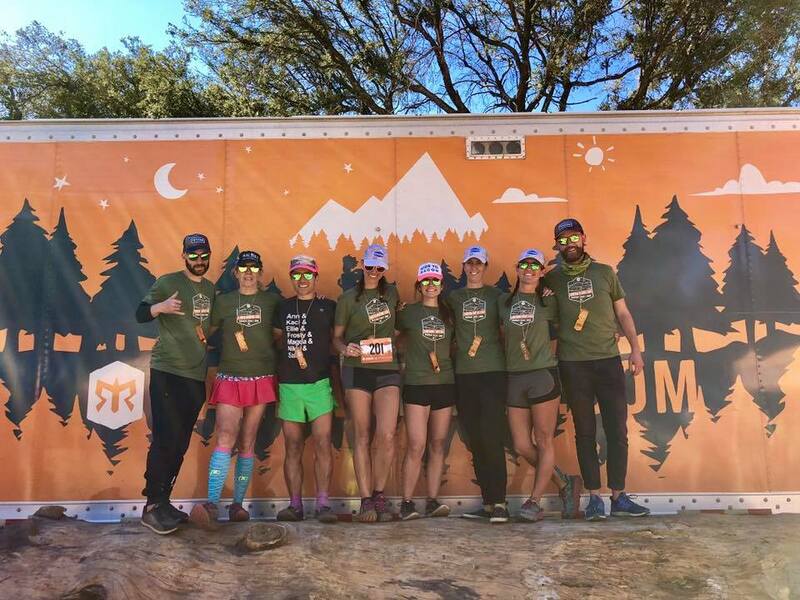 Instead, you all pitch a tent, set up camp and run three different loops (green, yellow, and red) of varying difficulty on the trails surrounding your campground. 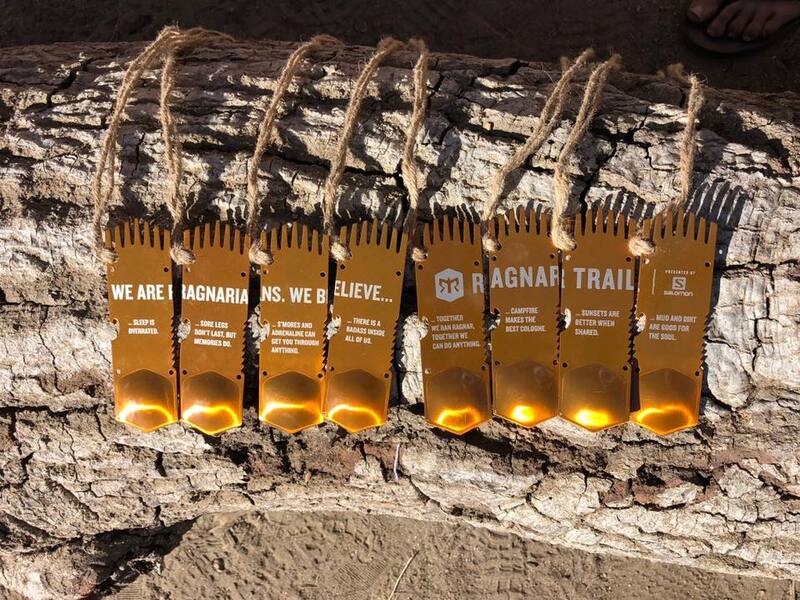 There’s even a Ragnar Village where you can eat, try on gear, hang out with other runners and teams, and try and huddle together for warmth around tiny space heaters and small campfires. 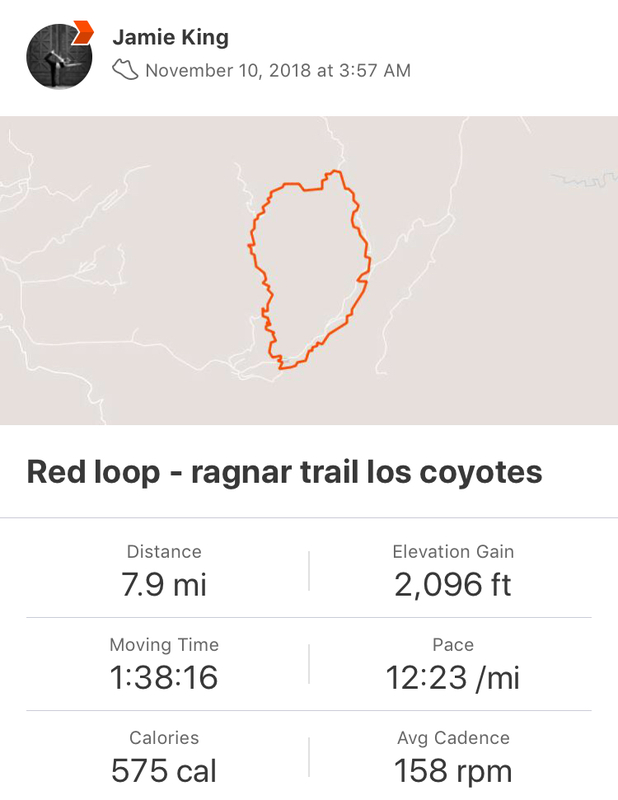 I was lucky enough to run Ragnar Trail Los Coyotes with the Sweat Pink team – a group of amazing runners – Jenny, Sean, Debbie, Sandra, Kristina, Jared, and Michael. 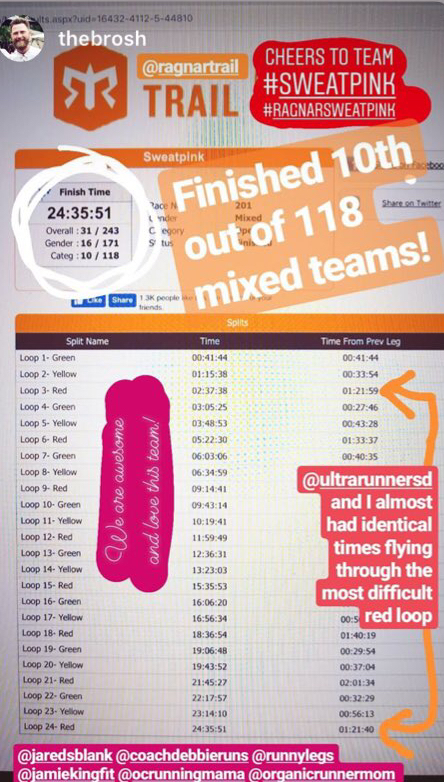 And spoiler alert, we placed top ten for the Mixed team category! The three Portlanders had planned to meet up in San Diego, rent a car, and arrive in Warner Springs late on Thursday night. After an epic Uber fail (my ride failed to show up and then my second ride GOT LOST), I almost missed my flight. I arrived about 30 minutes before we were scheduled to depart, late checked my bags, and ran from security to the gate with my shoes in hand as the plane was boarding. Thankfully, I made it on the plane (a little sweaty and anxious, of course), and we landed in San Diego a couple hours later where we picked up a few snacks, dinner, and also Michael before making our way to Warner Springs. Michael expertly navigated and we made our way to Warner Springs in just under two hours. 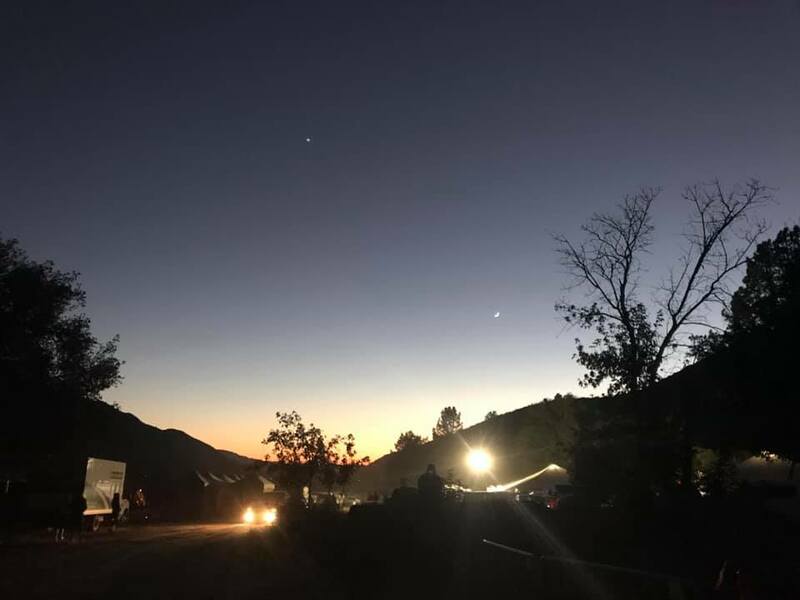 When we arrived at the campground, we circled around and around in the dark trying to find our team’s designated space before ultimately giving up and pitching tents next to the Smell Ya Later team. 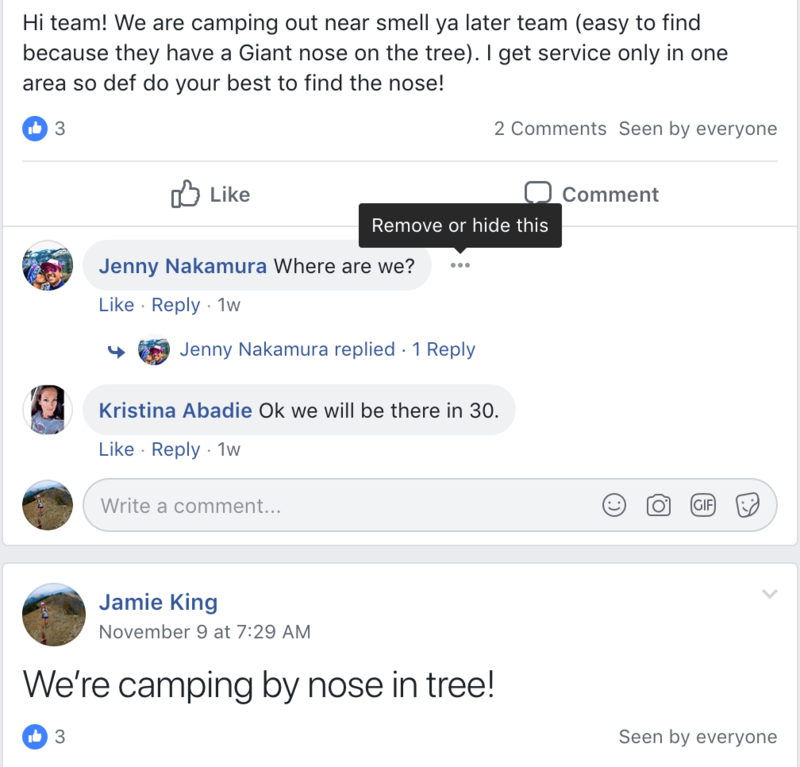 And as it turns out, camping near Smell Ya Later was the best idea ever, given they had giant noses in trees – and the giant noses were how the rest of our team located us and how I was able to find our camp each time (I’m really good at getting lost). Thanks team Smell Ya Later!! 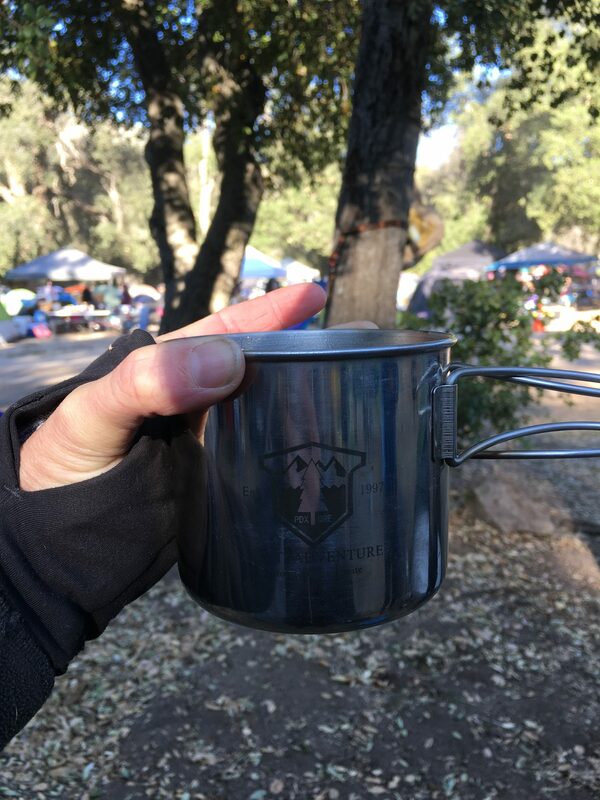 On Friday morning, we were up with the sun (well, actually we were up pretty much all night, given it was FREEZING outside) and made some campground coffee to warm our insides, got our things more or less organized after our late night arrival, and then by 8 am more of our team started to arrive. How cute are these pink sunnies (aptly named #flamingoesonaboozecruise) from Goodr (thanks Kristina!). 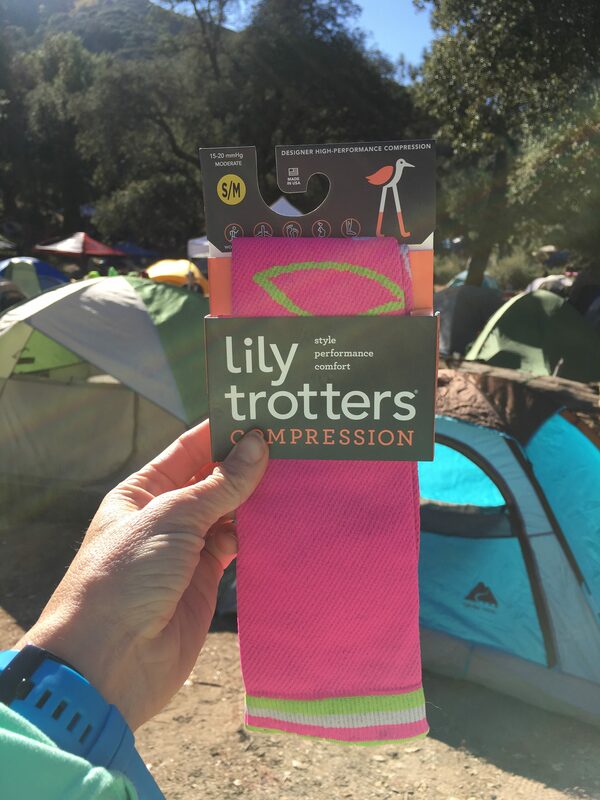 And of course to complete our look, we also received pink compression socks from LilyTrotters (which absolutely saved me during my cold night legs!). Thanks Jenny! 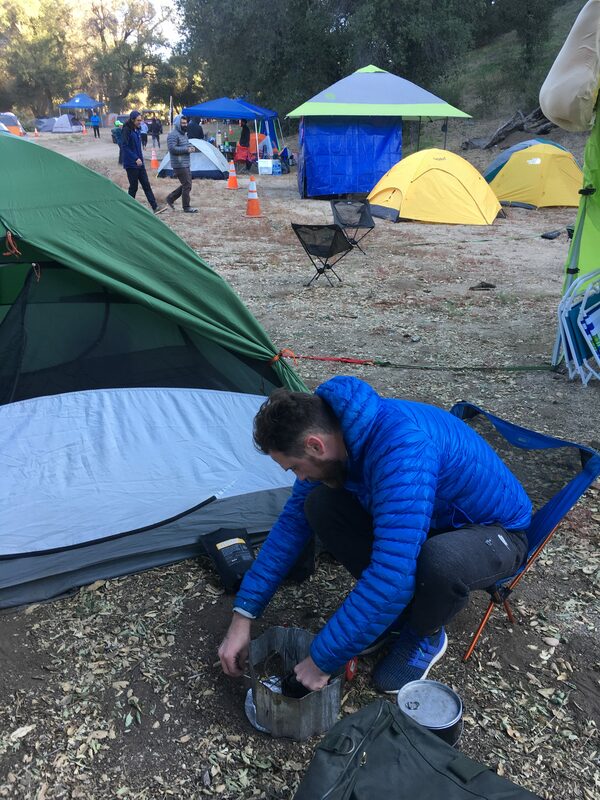 And since we knew we’d all be a stinking mess and have a stinking pile of laundry, we all did each other a favor and washed all of our gear in advance with WIN Detergent. 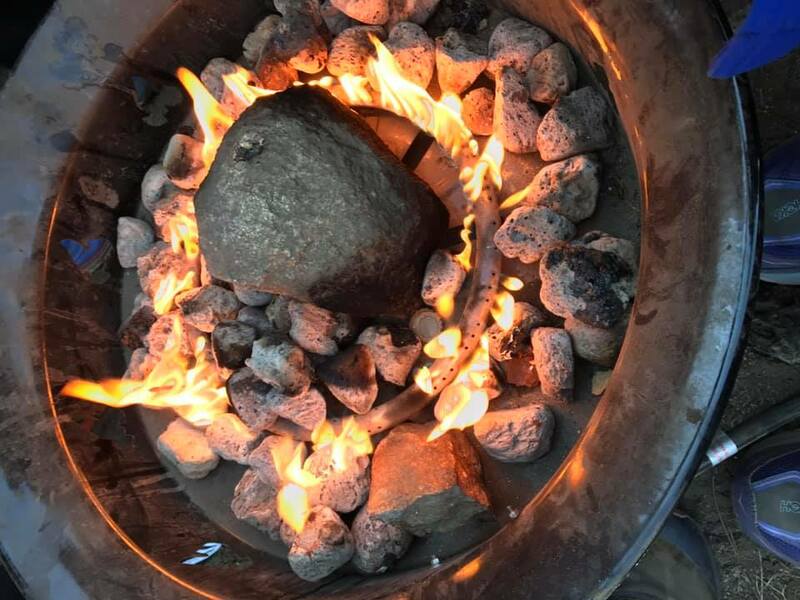 We figured we’d all start the race as fresh and clean as possible and then once it ended, we’d just burn everything (errr, wash it again with WIN). Get 30% off any single bottle purchase using WINSWPNK at checkout on Amazon. 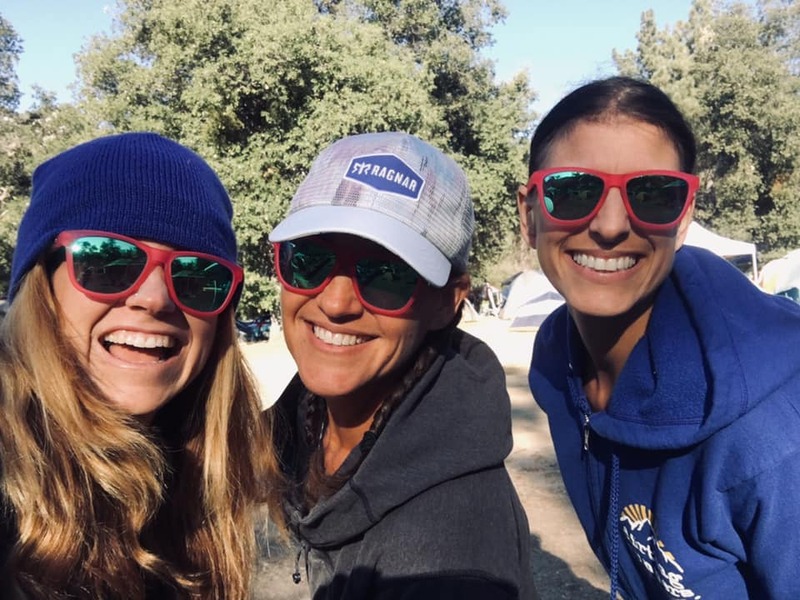 We started our race at 11 am on Friday – Kristina was our very first runner and would be tackling the green loop – and the weather was virtually perfect (it was sunny but not too hot). 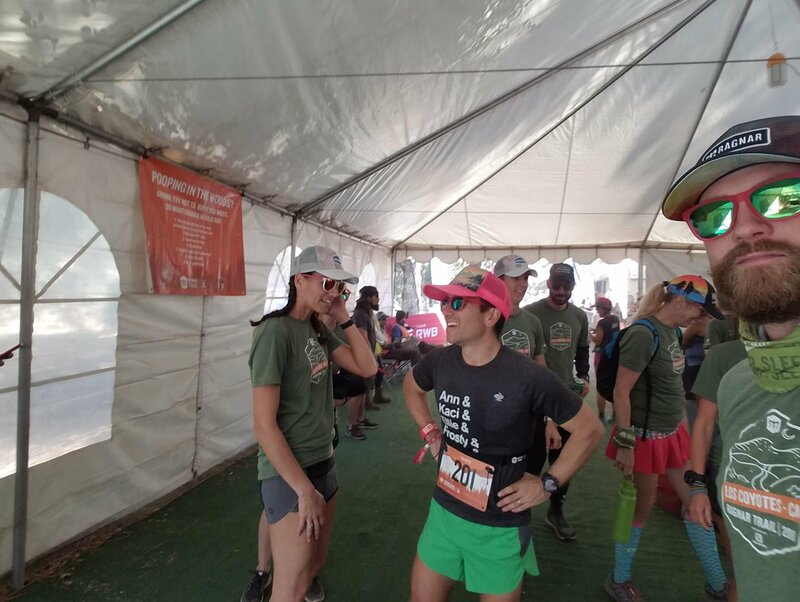 While she was out on the course, we joined the crowd around the runner tracking screen and waited until we got the signal she was close before I made my way into the exchange tent. Kristina came in looking strong and handed things off to me – I was running the yellow loop a little before 12. The loops all started with a run through the campground and then merged onto the trails, each with arrows indicating where to go. The green loop veered off on its own, while the red and yellow went up the hill for a steady 2 miles together. As I climbed my way up the first part of the loop, I was shocked by how difficult it was. 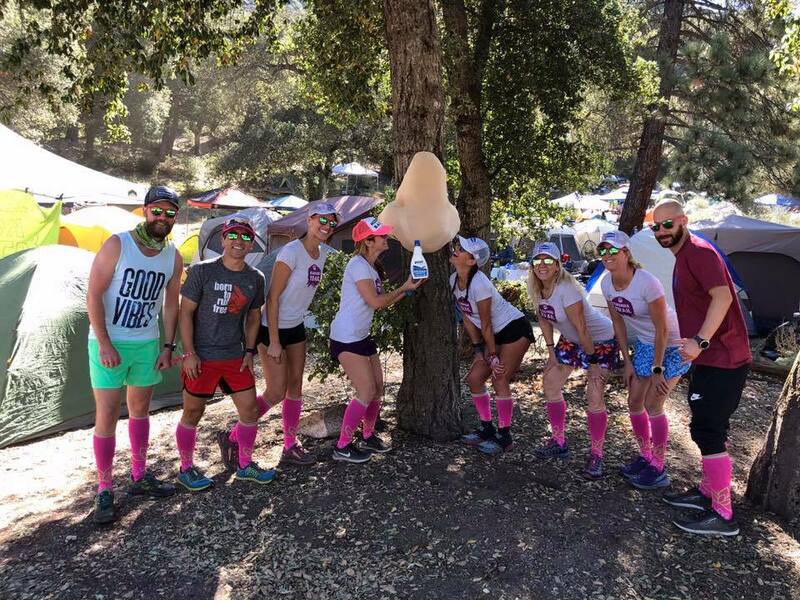 I hadn’t really taken into account that we started at 4,500 feet, or how dusty and sandy the terrain might be, and found myself huffing and puffing only a short way into the race. 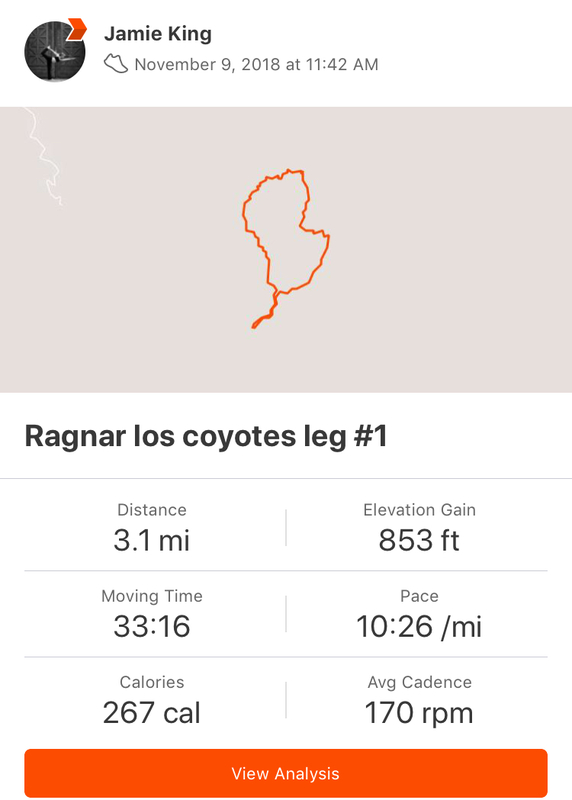 Despite the elevation, dust, sandy terrain and burning lungs, I managed to keep myself moving at a pretty steady pace. I inched my way up the hill, little by little, until finally we arrived at a viewpoint. A little after the viewpoint, we turned to go down a series of steep switchbacks. 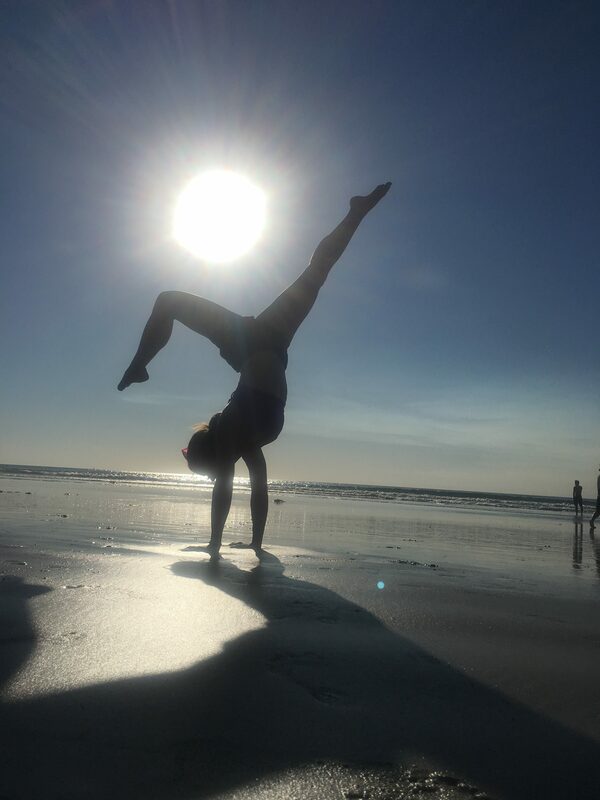 The switchbacks were pretty twisty and fast – not to mention full of soft sand, fallen trees, and loose footing – but I decided I’d just trust in my balance and let my legs fly. I finished in about 33 minutes and handed off to Michael who was running the red loop (and might I add, crushed the red loop – 7.9 miles – in just 1:20). 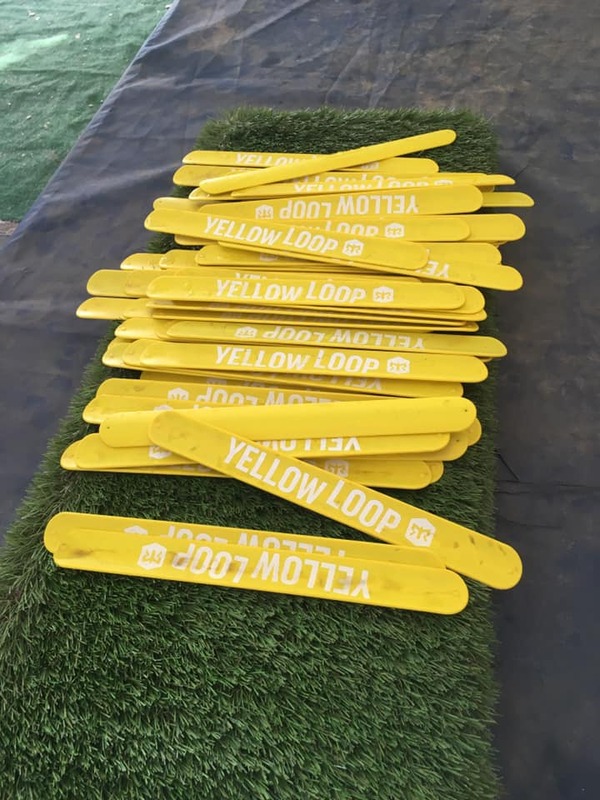 Jared tackled the green loop next (and shattered it), then it was Jenny with yellow (another solid performance), Sandra with red (another SPEEDY time! ), Debbie with green (our first runner to leave with a headlamp on), and finally Sean with yellow loop (dark and speedy). 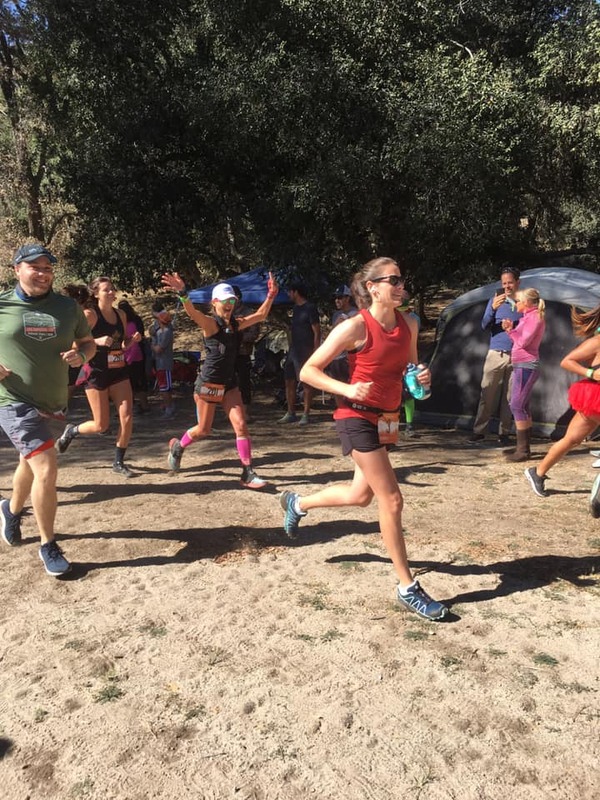 I admittedly missed some of our runners coming in from their first loops as I had to make my way to the car to pump during this time but was so happy to see we were moving so quickly through the course. Since there was no moon and quite a bit of dust, I flipped on both of my backup headlamps, and realized how dim my options really were. Thankfully Jenny and Sean were in camp and offered me one of their extra headlamps. 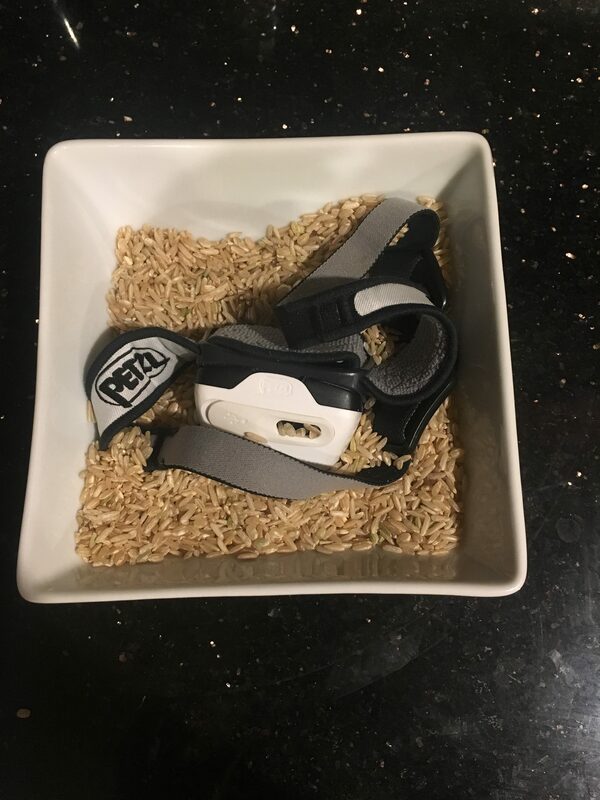 While it had way more lumen power (aka light up the forest potential) than my other two headlamp options, they did warn me in advance that the little battery pack was loose and might come undone. With a proper light and some heavy bundling, I made my way to the exchange area to stalk the runner tracking boards. 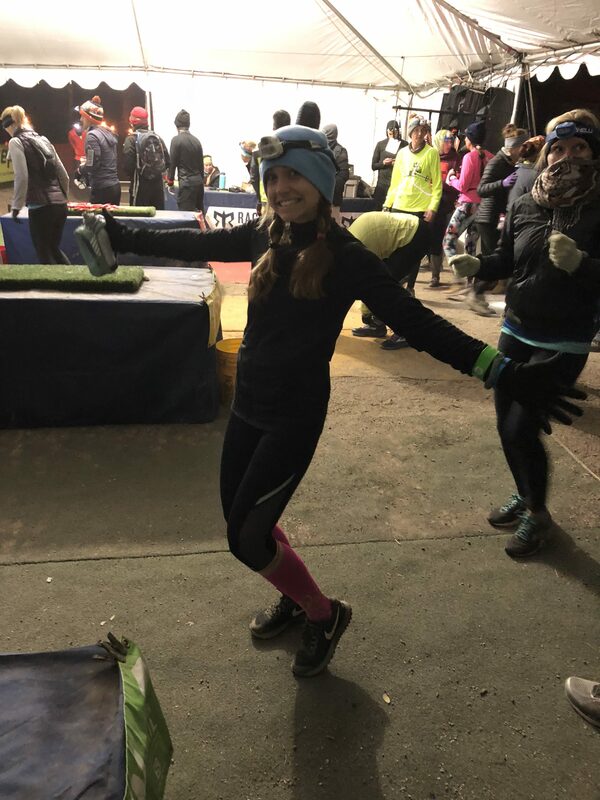 While waiting, I alternated between tracking runners and squeezing myself next to all of the other runners gathered around the space heaters in an effort to stay warm. And of course, I would dance. And jump. And pace. And at one point, Jared even got me to do some squats. Basically, I would do anything I could just to keep the blood flowing. Kristina came in just before 8 pm and ran like the champ that she is, especially given her 100 mile performance just a week before. Even though I was frozen, tired, and starting to feel a little sick (uh-oh), I was actually glad to start running. Running seemed to be the only way to actually feel warm and helped me get the feeling back in my toes after standing around (er, dancing) in the exchange tent for so long. 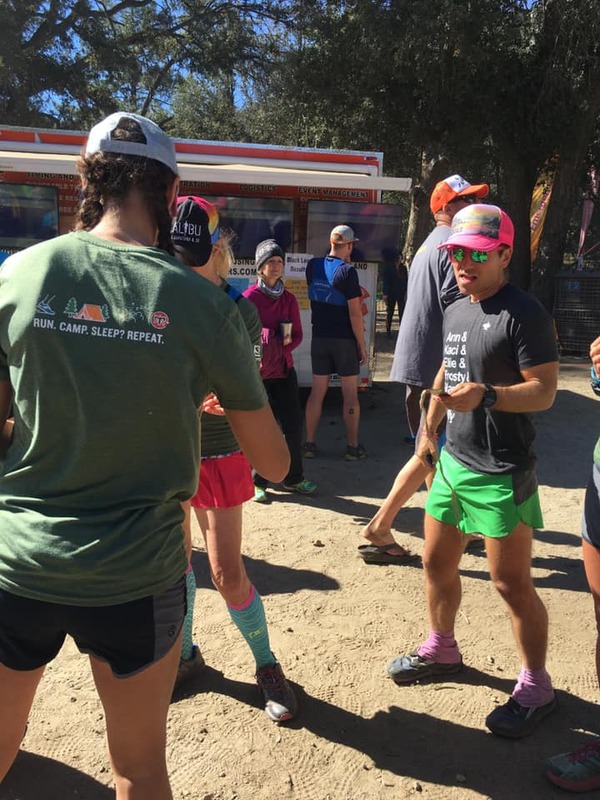 I felt really good and fast as I made my way through the green loop and by the time I reached the downhill portion into camp, I felt ready to fly to the finish. That said, almost as soon as I started my flying descent, the little battery pack on the headlamp came loose and started knocking me in the head. I grabbed ahold of it with one hand and just proceeded to run (figuring I was also getting a bicep workout!) straight into the exchange. I arrived in the exchange tent, still holding onto the battery pack, and didn’t see Michael anywhere. I started calling out our team’s number (201), and then just started yelling “Michael…Michael…” but he wasn’t in there. I finally made my way out towards the village and surprised him when I showed up by the runner tracking screens which apparently hadn’t been updating. And just to brag a little, I guess I really did fly because according to Strava, I was in the top 5 women to complete the green loop. Michael set off quickly for his second loop – the yellow loop – and Jared and I hung around and waited (and did our best to stay warm). Michael crushed his second loop as well (of course) and then we waited until Jared was out on the course before we retreated back to camp. It was sometime around 10 pm and I desperately needed to pump and figured I should also get my wet clothes off, do my best to stay warm, and try and get a little sleep. I tried to sleep after pumping but was so cold, I don’t think I managed to actually sleep for more than an hour. 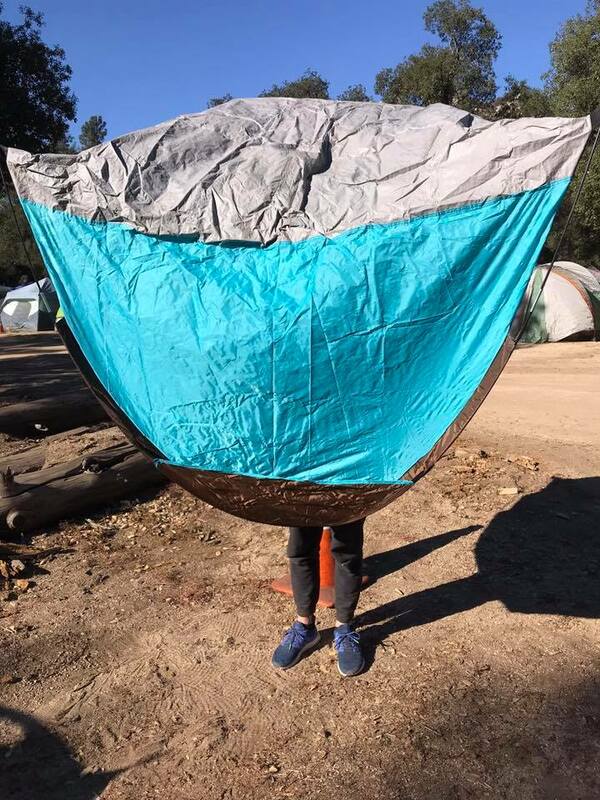 I kept shifting back and forth in my sleeping bag, trying to make myself into a little ball to maximize warmth, and shifting so that I could include my hands and feet in the full body cuddle as much as possible. I even tried wrapping my Rumpl blanket over the top of my sleeping bag so that I could block any cold air from entering, but all of my efforts seemed futile given I was wide awake when my alarm went off at 2 am. 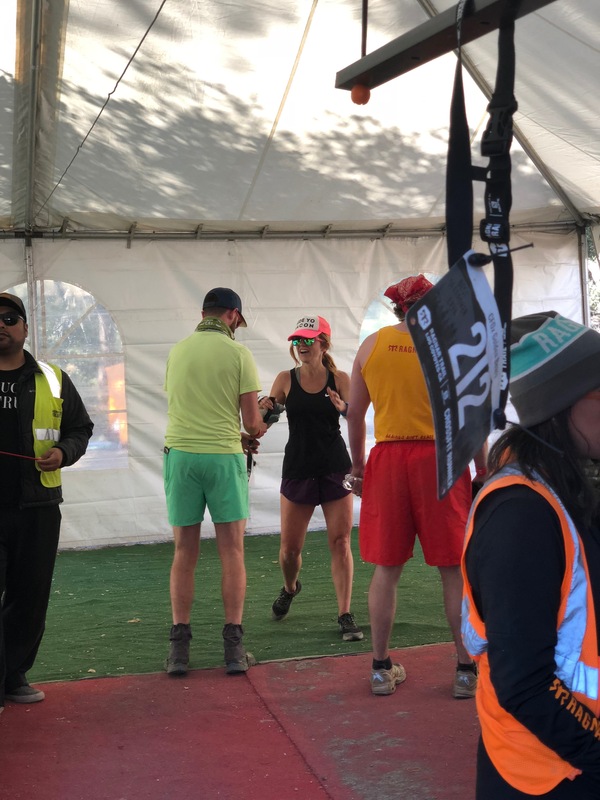 Since Jared was taking Kristina’s last loop, I also wanted to make sure he was up and ready to go and we sleepily willed ourselves out of sleeping bags and over to the exchange area as quickly as we could. Sean was out on the course running his second loop (the green loop) so we knew he’d be in quickly. As expected, Sean came in to the exchange in a flash, and as Jared set off to run the yellow loop, I waited in the exchange area preparing to run my last (and longest) loop, while Sean made his way towards camp to start getting other runners up and ready to run. Jared took a little longer on his loop than expected because he got off course but he came in smiling and sent me off on my final loop. I took off for my last loop (the red loop) around 4 am, and was feeling a pretty off. At this point, I was almost certain that it wasn’t just the cold or the lack of sleep making me sneeze, cough, and feel chilled, I suspected that I was actually coming down with something (which turned out to be a pretty bad head cold). As soon as I started the climb, I felt my fingers starting to freeze and had to slide my waterbottle from my hand to my wrist (where it just dangled) so that I could ball my hands up and try to keep them warm. My toes were also cold, so as I climbed I did my best to wiggle them around in my shoes. The climb was a lot harder in the dark but I was motivated to keep moving, in an effort to stay warm. Once I got to the first viewpoint, I knew we’d get a little downhill and prepared to start moving more quickly. 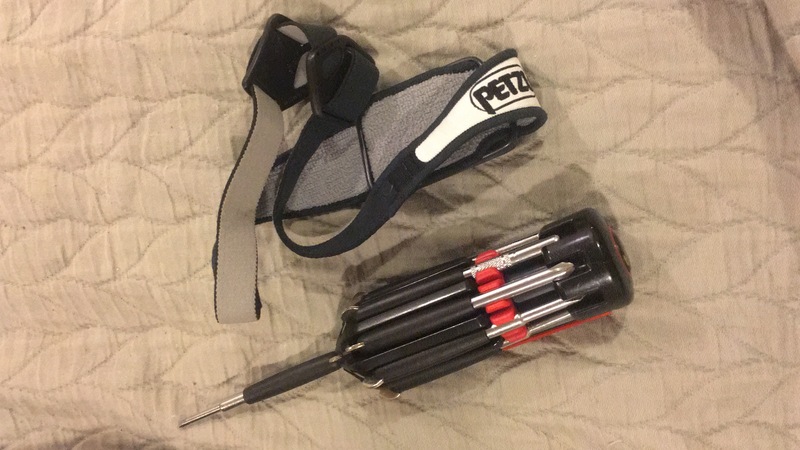 As soon as I started the steep descent, the headlamp battery pack came loose and I knew I wouldn’t be able to constantly try and put it back together and get it on so I just removed it from my head entirely and held it in one hand. The switchbacks were particularly difficult at night; with loose sand, sharp turns, down trees, and all kinds of runners to watch out for. It felt like a balancing act between keeping my path lit (and my hand in the right position to keep the headlamp’s light on the trail), and to move quickly but also carefully. Unlike the yellow loop, it wasn’t downhill to the finish line after the first two mile climb; instead we descended for less than a mile before we started to climb again. The next climb felt more protected from the elements and I was able to stay much warmer which was a huge relief. It felt good to unball my hands a little and stop worrying about wiggling my toes around so much. I breezed my way up to the top of the climb and figured there couldn’t possibly be much course left. 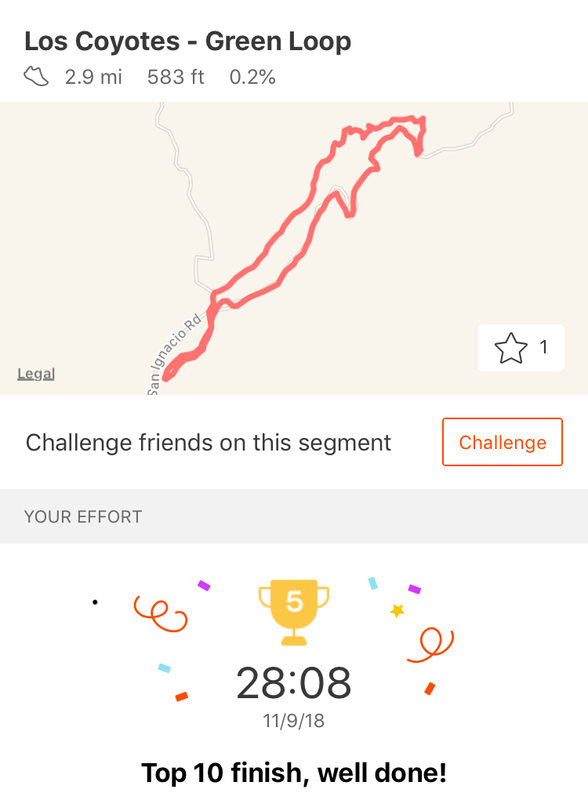 I challenged myself to just keep running until the finish line and while there were a few more little hills, it was a pretty manageable challenge. I came in to the exchange and handed off to Michael who was good and ready to run his final green loop. At this point, I needed three things: warm, dry clothes, to pump in the car with the heat on full blast, and hot coffee. 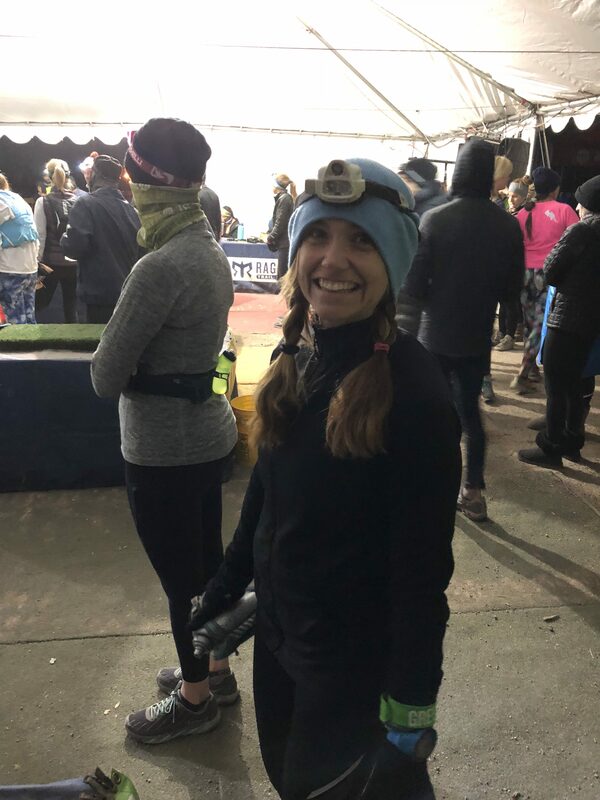 I made my way to camp, alerted the next runners that Michael was out on the course, and then gathered my things and made the trek out to the car to pump (with my Rumpl blanket draped over me as I walked, of course). 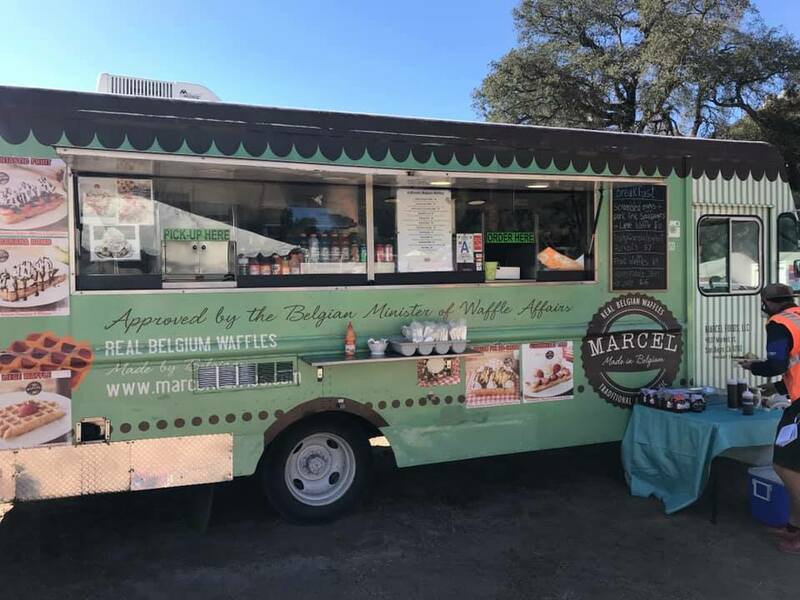 As soon as I was finished pumping, I made my way back into the village, found a breakfast burrito and hot coffee and posted up by the fire where I could watch and wait for our runners to come in. One by one, our runners were coming in, finishing their last loops and looking strong as ever. Once it was Sean’s turn to finish his last loop, the sun was shining and the temps were nice and warm. We all gathered around the exchange area ready to run him into the finish line. He came in quick and smiling and we finished the race as a team. Feeling really proud of all of these amazing runners. And feeling so thankful for the opportunity to be on such an amazing team! Just kidding, there were only three loops. After we celebrated our finish, we dismantled camp, said our goodbyes, and parted ways. 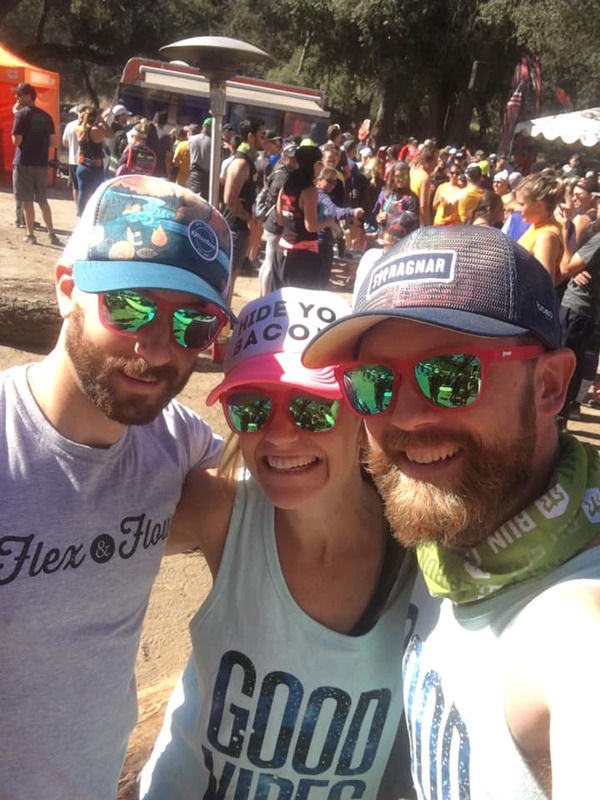 The three Portland runners (including myself) headed back to San Diego, giving ourselves more than enough time to spare before our flight as I was anxious to get home to feed the baby. We ended up having a few hours to kill and made our way to the beach to unwind, soak our feet, and swim (if you’re Michael). We got to the airport early, breezed through check-in, had a quesadilla, and made our way home. Some of us went straight to bed, others went out on the town (ahem, Michael). All in all, it was an amazing experience and I am so thankful that I got to be a part of it. And even more thankful that I got to spend time running with such an amazing group of people! 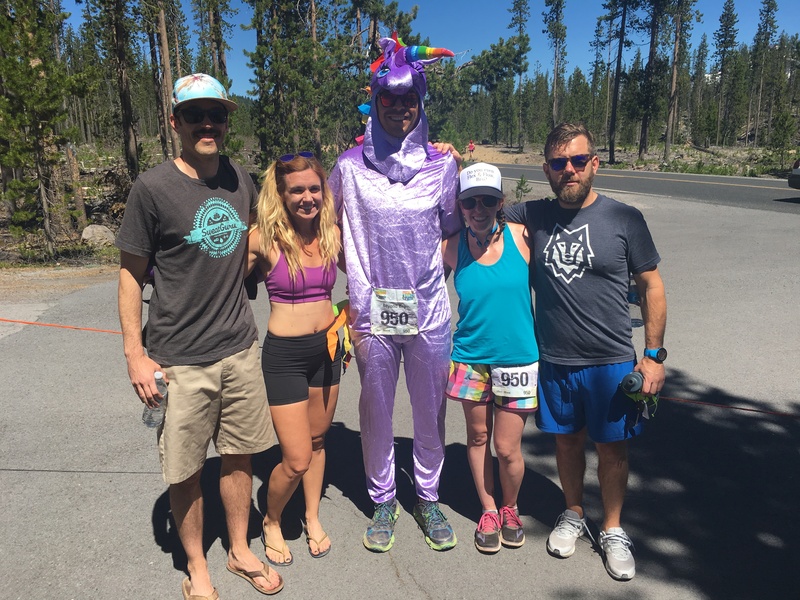 Disclaimer: This post was sponsored by Ragnar Relay through my partnership with Fit Approach. 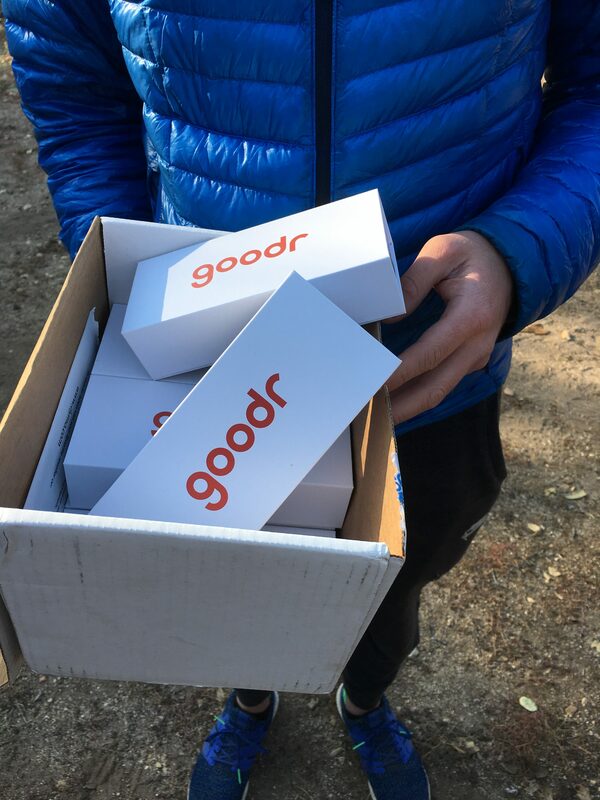 I was also provided with free product from WIN Detergent, Goodr, and Lily Trotters. That said all experiences, thoughts expressed, memories, and bad jokes are my very own. I truly appreciate all of the brands that support the Sweat Pink community. I’m so so impressed and inspired by all of you! Those conditions, sounds, well, not so desirable and love the way you all kept each other going with dancing and good vibes! 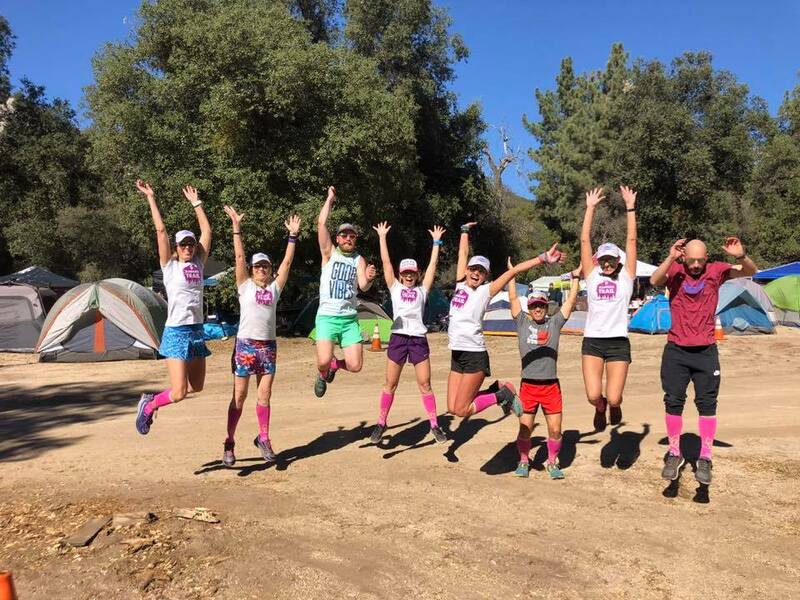 Way to go team Sweat Pink!! Thanks, I had the best teammates for a cold adventure like this! This was the most amazing event, probably one of the hardest races I’ve ever done. I love this team! You were all so supportive of this slowpoke and you were all so fast to make up for it! Did I say hardest? It was also one of my best racing experiences ever too. 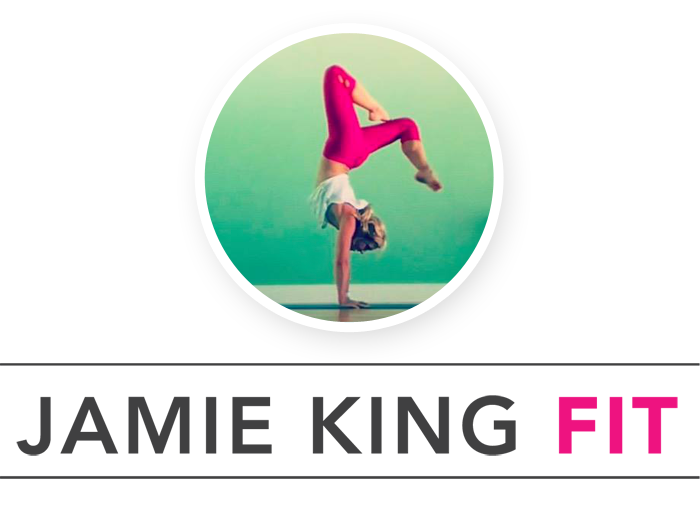 You are NOT a slow poke in the slightest – you are amazing – thank YOU for being such an awesome teammate! It was HARD and COLD! What an amazing performance, team #sweatpink! Also, you’re my hero for pumping in those conditions. That sounds straight up COLD. It was STRAIGHT UP COLD! AHH! Super fun! What a great group! Such an awesome team, so lucky to run with this bunch! This looks so fun, in a crazy way that only runners would understand. I love that you were able to keep up your pumping through it all! Haha, yes ,fun in that way for sure. Pumping was probably the hardest part of all of it.